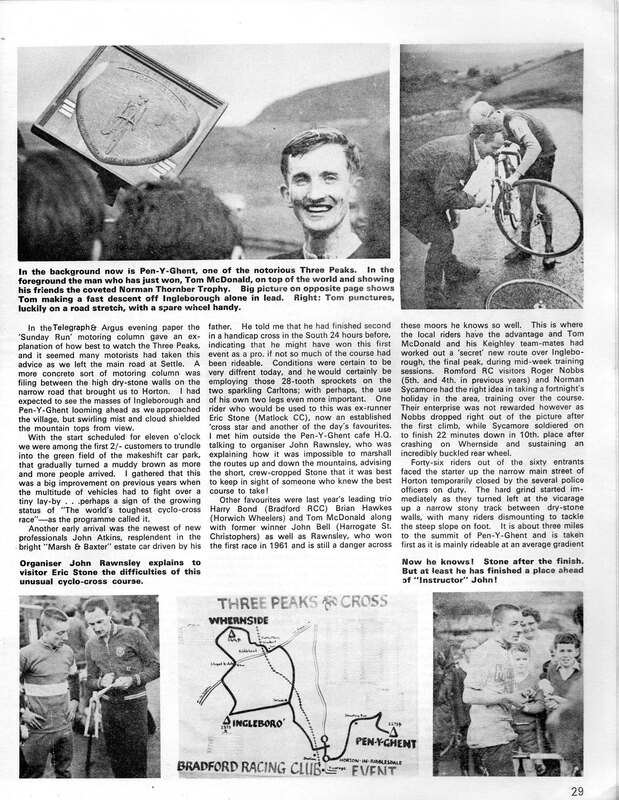 Barry Davies sent in a great article on the 1968 race from International Cycle Sport magazine. As he realised he had achieved his ambition he took off his bedraggled yellow racing hat and threw it into the air to express his joy before being enveloped in a bobbing mass of admirers, and having the microphone of Yorkshire Television thrust into his face to record the story of the race and why he competes in such a ‘mad’ pursuit. THERE are all sorts of races in cycle sport. 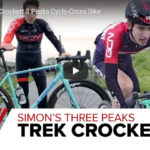 Stage races, one-day road races, time trial cyclo cross-and the Three Peaks. This early winter classic of the cyclo-cross brigade has gained a fearsome reputation for toughness in its eight years of existence-and after watching the 1968 version I agree that it is in a category on its own. You can imagine how rugged the 26-mile route is by the fact that winner Tom McDonald (Keighley St. Christophers) took over three hours, while the last of the 35 finishers. went round in 6 hours 47 minutes 10 secondsl This year the race took place on Sunday, 29th September, starting and finishing at Horton- in-Ribblesdale. I had arrived at Keighley (30 miles away) on Saturday afternoon, having ridden most of the way from my Surrey home. The blustery wind and heavy showers on the Friday had helped blow away some of the cob- webs of watching the Wembley Six for a week, and I managed to reach Loddington youth hostel as darkness fell on Leicestershire laneland. It seemed I could not get away from those Wembley Sixes, even here, as I arrived at the same time as a Mrs. Bailey of the South Bucks. CTC,and I found out her sons were named Piet and Toni after Van Kempen and Merkens! 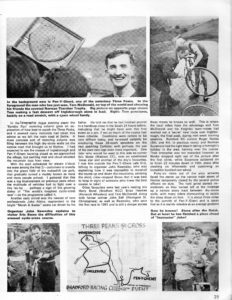 From the editorial page of this magazine you will know that Keighley is the home of our publishers, the Kennedy Brothers. 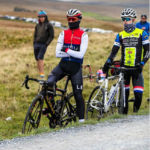 This year, Paul made a comeback to racing with the Keighley St. Christophers, but when I stayed the night at his house he did not dare to hope that a club-mate would win the big event next day. I had intended to ride those 30 miles to Horton- in-Ribblesdale, but I was glad of the lift with local ‘cross fan Spike Howley, with the rain pouring down. Conditions looked more than unpromising as the anglers huddled under umbrellas at Gargrave, and I remarked that this would probably keep the crowds away. 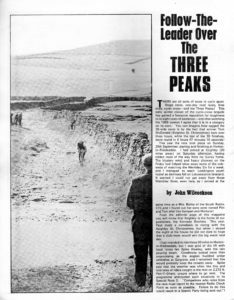 Spike said that the weather was often like this and told tales of riders caught in the mist on 2,273 ft. Pen-Y-Ghent, unsure where to go next. The programme anticipated such situations in its Special Note 3: “Competitors who retire from the race must report to the nearest Radio Check Point as soon as possible. Failure to do this could result in a Search Party being sent out.”! In the Telegraph & Argus evening paper the Sunday Run’ motoring column gave an ex-planation of how best to watch the Three Peaks, and it seemed many motorists had taken this advice as we left the main road at Settle. A more concrete sort of motoring column was filing between the high dry-stone walls on the narrow road that brought us to Horton. 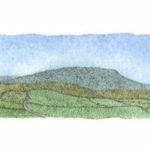 I had expected to see the masses of Ingleborough and Pen-Y-Ghent looming ahead as we approached the village, but swirling mist and cloud shielded the mountain tops from view. With the start scheduled for eleven o’clock we were among the first 2/ – customers to trundle into the green field of the makeshift car park, that gradually turned a muddy brown as more and more people arrived. I gathered that this was a big improvement on previous years when the multitude of‘vehicles had to fight over a tiny lay-by . . .perhaps a sign of the growing status of ”The world’s toughest cyclo-cross race”-as the programme called it. Another early arrival was the newest of new professionals John Atkins, resplendent in the bright “Marsh 8 Baxter” estate car driven by his father. He told me that he had finished second in a handicap cross in the South 24 hours before, indicating that he might have won this first event as a pro. if not so much of the course had been rideable. Conditions were certain to be very diffrent today, and he would certainly be employing those 28-tooth sprockets on the two sparkling Carltons; with perhaps, the use of his own two legs even more important. One rider who would be used to this was ex-runner Eric Stone (Matlock CC), now an established cross star and another of the day’s favourites. 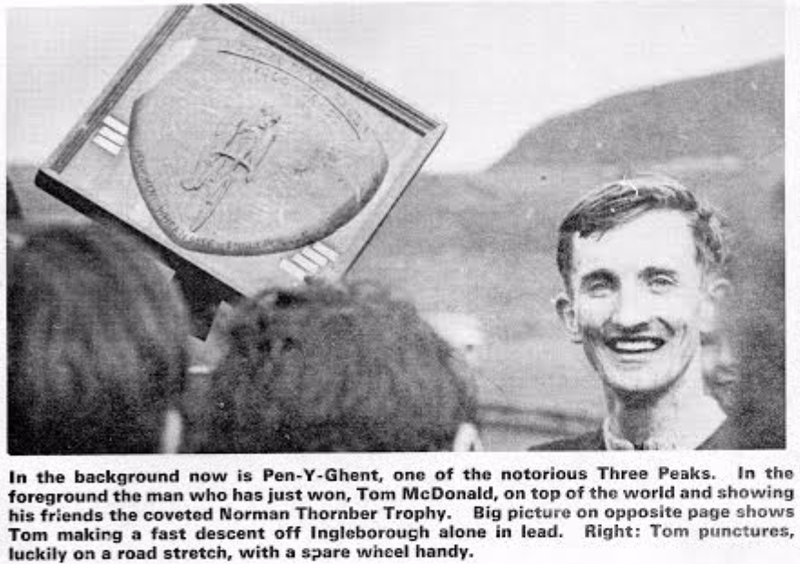 I met him outside the Pen-Y-Ghent cafe HQ talking to organiser John Rawnsley, who was explaining how it was impossible to marshall the routes up and down the mountains, advising the short, crew-cropped Stone that it was best to keep in sight of someone who knew the best course to take! 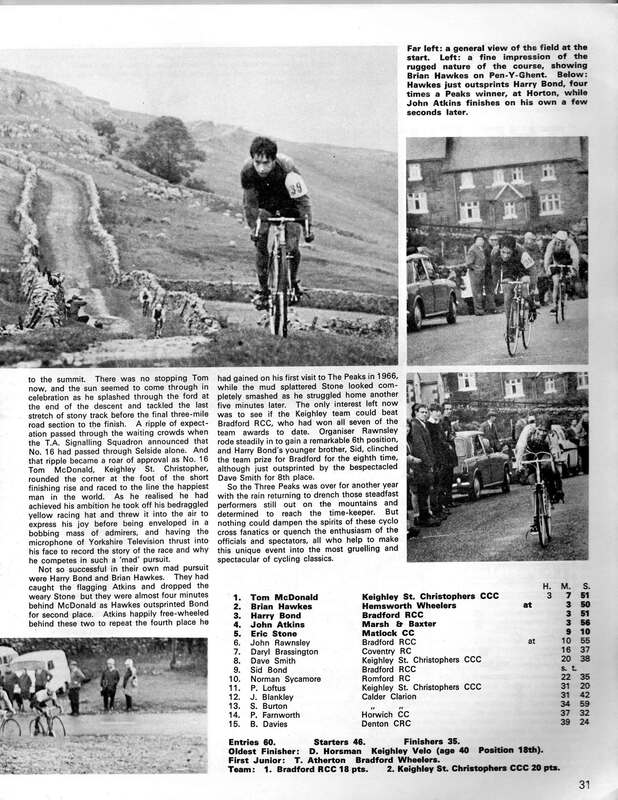 Other favourites were last year’s leading trio Harry Bond (Bradford RCC) Brian Hawkes (Horwich Wheelers) and Tom McDonald along with former winner John Bell (Harrogate St. Christophers) as well as Rawnsley, who won the first race in 1961 and is still a danger across these moors he knows so well. This is where the local riders have the advantage and Tom McDonald and his Keighley team-mates had worked out a ’secret’ new route over lngleborough, the final peak. during mid-week training sessions. Romford RC visitors Roger Nobbs (5th. and 4th. in previous years) and Norman Sycamore had the right idea in taking a fortnight’s holiday in the area, training over the course. Their enterprise was not rewarded however as Nobbs dropped right out of the picture after the first climb, while Sycamore soldiered on to finish 22 minutes down in 1oth. place after crashing on Whernside and sustaining an incredibly buckled rear wheel. Forty-six riders out of the sixty entrants faced the starter up the narrow main street of Horton temporarily closed by the several police officers on duty. The hard grind started immediately as they turned left at the Vicarage up a narrow stony track between dry-stone walls, with many riders dismounting to tackle the steep slope on foot. 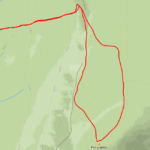 It is about three miles to the summit of Pen-Y-Ghent and is taken first as it is mainly rideable at an average gradient to the summit. There was no stopping Tom now, and the sun seemed to come through in celebration as he splashed through the ford at the end of the descent and tackled the last stretch of stony track before the final three-mile road section to the finish. A ripple of expectation passed through the waiting crowds when the T.A. Signalling Squadron announced that No. 16 had passed through Selside alone. And that ripple became a roar of approval as No. 16 Tom McDonald, Keighley St. Christopher, rounded the corner at the foot of the short finishing rise and raced to the line the happiest man in the world. As he realised. he had achieved his ambition he took off his bedraggled yellow racing hat and threw it into the air to express his joy before being enveloped in a bobbing mass of admirers, and having the microphone of Yorkshire Television thrust into his face to record the story of the race and why he competes in such a ‘mad’ pursuit. Not so successful in their own mad pursuit were Harry Bond and Brian Hawkes. They had caught the flagging Atkins and dropped the weary Stone but they were almost four minutes behind McDonald as Hawkes outsprinted Bond for second place. Atkins. 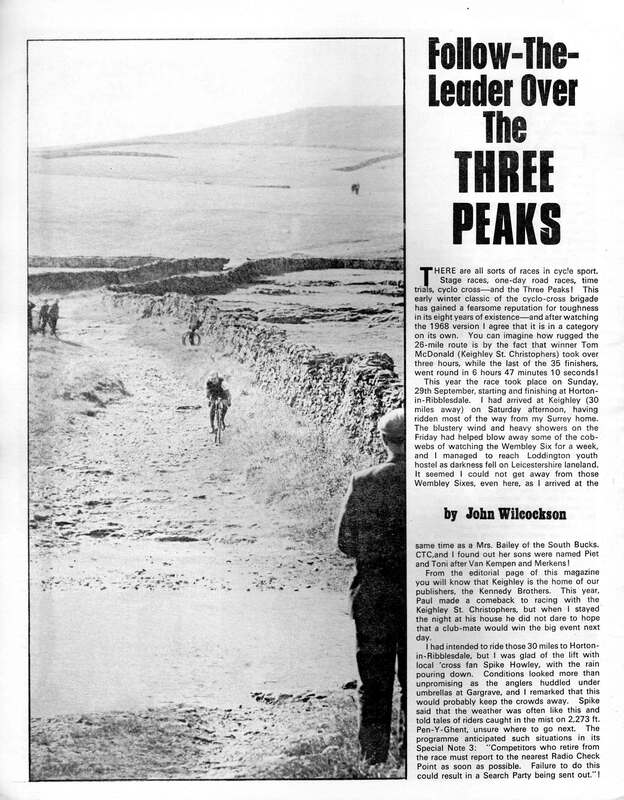 happily free-wheeled behind these two to repeat the fourth place he had gained on his first visit to The Peaks in 1966, while the mud splattered Stone looked com- pletely smashed as he struggled home another five minutes later. The only interest left now was to see if the Keighley team could beat Bradford RCC, who had won all seven of the team awards to date. Organiser Rawnsley rode steadily in to gain a remarkable 6th position, and Harry Bond’s younger brother, Sid, clinched the team prize for Bradford for the eighth time, although just outsprinted by the bespectacled Dave Smith for 8th place. 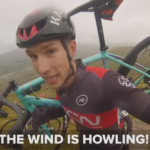 So the Three Peaks was over for another year with the rain returning to-drench those steadfast performers still out on the mountains and determined to reach the time-keeper. But nothing could dampen the spirits of these cyclo cross fanatics or quench the enthusiasm of the officials and spectators, all who help to make this unique event into the most gruelling and spectacular of cycling classics. 9. Sid Bond Bradford RCC s. t.
Entries 60. Starters 46. Finishers 35. Oldest Finisher: D. Horsman Keighley Velo (age 40 Position 1”). First Junior: T. Atherton Bradford Wheelers. Team: 1. Bradford ncc 18 pts. 2. Keighley St. Christopher: CCC 20 pts.